To truly become a hub for patient engagement, a mobile wayfinding platform must do more than guide patients from Point A to Point B. The platform needs to integrate appointment scheduling, physician directories, patient portals and other features that improve access to care and meet medical care needs. The platform must also meet the organization’s technical and functional requirements and provide analytics to support strategic key performance indicators. AHA’s guide to developing a mobile wayfinding RFP starts your organization along the path of thinking critically into the vendor requirements, technical specifications, and the patient engagement opportunities your platform will need for optimal user experience and ROI. To read the guide, complete the form on the right. 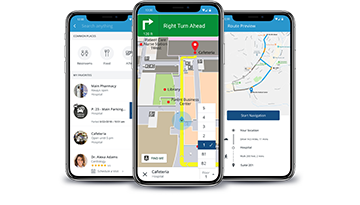 Gozio’s guide to developing a mobile wayfinding RFP starts your organization along the path of thinking critically into the vendor requirements, technical specifications, and the patient engagement opportunities your platform will need for optimal user experience and ROI. To read the guide, complete the form below.